In the big volume of old pictures, which we described last week as being in the possession of the Radnor Historical Society, there are several pictures of the Askin Cottage, one of which is shown below. By modern standards, this would be a good-sized house rather than a cottage, although by comparison with the mansion which Mr. Askin called “Louella House,” the smaller place was well named. It stood northeast of the big house and faced directly south. This picture shows the large circular garden, directly in front of the house, with two gardeners at work. The driveway goes completely around the garden. The table of contents in the front of the book describes the place as the “Old Maule Manor House,” bought from the Richards family, who paid five shillings per acre for the land, which they held under the “Penn Patent.” Mr. Maule was among the oldest landowners in this part of Radnor township. At right is a rear view of the same house, taken from the northwest corner of the lawn. The railroad tracks ran to the rear of the house, just out of sight in this picture. In addition to another view, which was shown in “Your Town and My Town” in the October 10, 1952, issue, there is still another picture in the old book which shows an ornate circular summer house, open on all sides, with a bench all around its interior. This well-known landmark of its time stood between the cottage and the mansion. 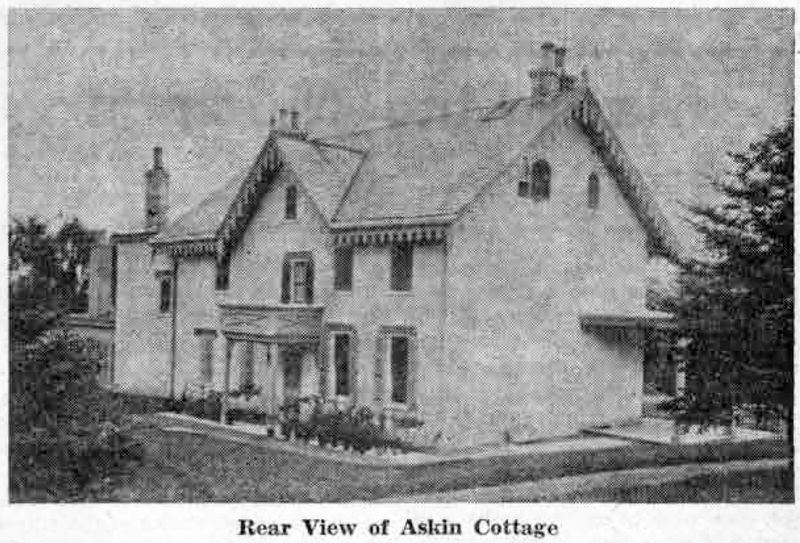 Although the house shown below was not part of Mr. Askin’s holdings, the picture is included in the album because of its connection with the Richards family, who at one time owned “Maule Cottage,” which Mr. Askin occupied while he built the mansion. This picture has been tentatively identified by one of Wayne’s old timers, who saw the album, as an old stone house on the left-hand side of Radnor-Chester road, just before the road goes under the overpass at Radnor station. 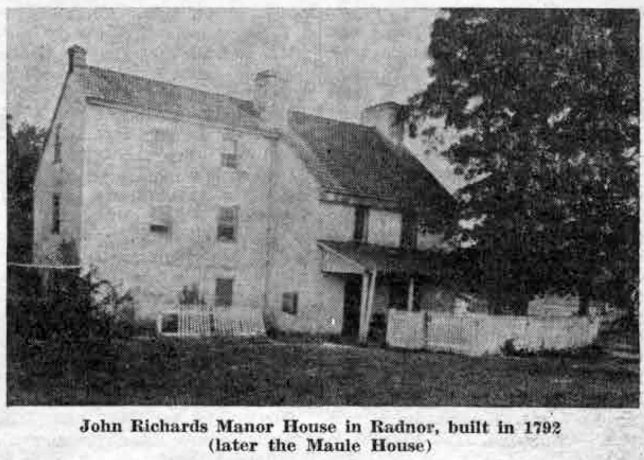 If so, it was occupied for some time by members of one of the Torpey families of Radnor, and has been recently remodeled by the James F. Bodines and occupied by them. Positive identification from any of our readers would be interesting. With proposed changes and additions to the Louella Apartments providing front page headlines in last week’s “Suburban,” your columnist has turned back to the series on old Louella House which she wrote for this column in October, 1952. 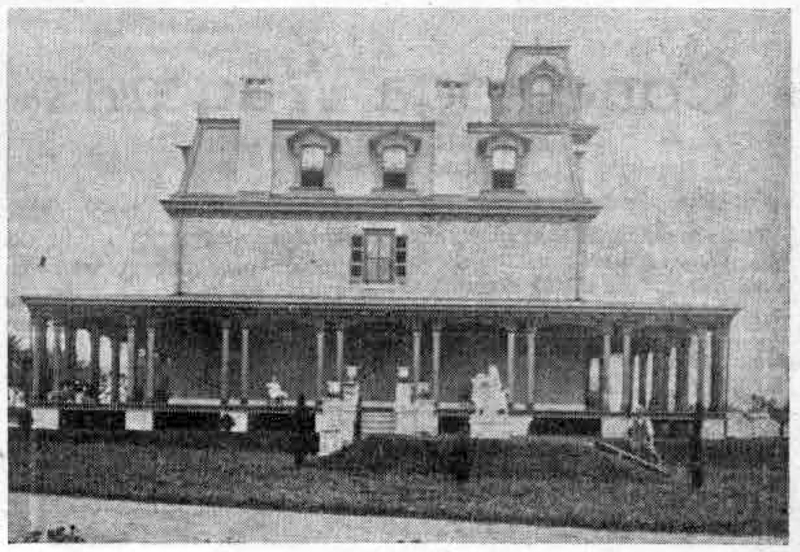 The first article showed a front and a back view of one of Wayne’s early landmarks as it looked in 1867. Three handsome books, all filled with the same pictures of “Louella, Home of J. Henry Askin,” were compiled in 1812 by F. Gartekunst, 712 Arch street, Philadelphia. One remained in the possession of the Askin family; a second was presented to the John L. Mather family, while the third was given to Frank Smith, private secretary to George W. Childs, who, with Anthony J. Drexel, founded the Wayne Estate in the 1880’s. Mr. Smith presented this volume to Herman P. Lengel, through whose generosity it has been placed in the archives of the Radnor Historical Society. The left side of this picture shows the back view of old Louella House, the front being marked by the stately cupola which still tops the building on its Lancaster avenue side. In the 1860’s this cupola commanded a far flung view over what were then farmlands in all directions. The two wings, to the east and west, were added at a later date, the eastern wing taking the place of a large greenhouse. 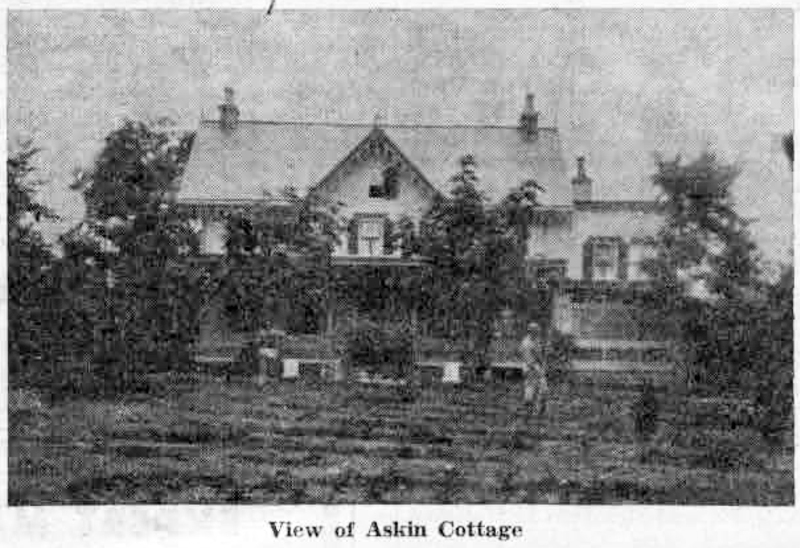 Mr. Askin is often called the founder of Wayne, having come here to live with his family in the early 1860’s. Wayne was then the little hamlet of Cleaver’s Landing, so called because trains of the old Lancaster and Columbia Railroad stopped just west of the present Wayne station to pick up milk to be shipped to Philadelphia from the Cleaver farm. The name “Louella,” which succeeded Cleaver’s Landing, was a combination of Louise and Ella, Mr. Askin’s daughters’ names. Later, Louella was changed to Wayne, but the former name has been perpetuated in Louella Court Apartments, about which the present controversy centers; Louella drive and Louella court. Louella drive is the two-way automobile entrance and exit from Lancaster avenue to Louella court. On both sides of the drive are a number of small shops, while various attractive homes face on Louella court itself, the driveway of which completely encircles the apartment house. Opposition to remodelling plans of Herman Grossman, present owner of Louella Court, were vigorously voiced at last week’s public meeting in the Township Building, not only by tenants of apartments, but by owners of these Louella court houses as well. The plans, which would include the erection of a number of garages on the site of the present apartment house lawn would, in the opinion of protesting property owners, constitute a traffic hazard, decrease visibility and deprive children of the area of a recreation spot. The above picture was taken from “Main Line Beautiful,” a real estate magazine published in 1928. 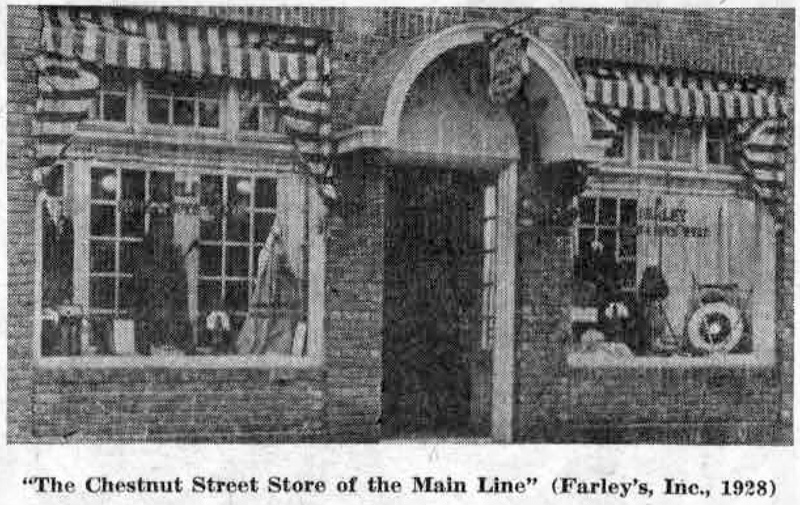 Farleys, a dealer in athletic goods, as well as in men’s and boys’ wear, was the predecessor of the present Wayne Men’s Shop. In writing of the Wayne Estate houses from time to time, your columnist has often quoted from the booklets which advertised the building and the sale of these houses. The descriptions were flowery ones indeed, but they were unequalled, if not outdone, some 50 years later when J. Howard Goodwin, in 1928, brought out his “Main Line Beautiful,” the real estate magazine about which we wrote last week. Officers of the Wayne Chamber of Commerce, which authorized the advertisement, were Charles D. Lyman, president; Charles R. Meyers, vice president, and C. Walton Hale, secretary-treasurer. All are still well-known citizens and businessmen of this area. Among the local real estate firms which advertised in the 1929 ”Main Line Beautiful” magazine was that of Joseph M. Fronefield, father of J.M. Fronefield, 3d, located in the office building which was erected in 1927 on West Lancaster avenue. The firm specialized in the sale of “Country Homes and Farms.” George M. Aman, Sons, a firm consisting of Ralph L. Aman and George M. Aman, Jr., had two offices, one at 1218 Chestnut street in Philadelphia, and the other at 114 Audubon avenue, Wayne. Their specialties were “Insurance and Mortgages, Building and Loan Association.” Fred H. Treat, who listed “Main Line Homes and Farms,” was also the general rental and sales agent for the Windermere Court Apartments, which had been completed at that time. J. Howard Mecke, Jr., with offices in the Packard Building, Philadelphia, was advertising “Something Unusual at Wayne” with the explanation that “In the Martin’s Dam Section, just five minutes by motor north of Wayne Station on the Main Line, a Colonial Village has been started.” Houses were to occupy sites varying from 1½ to five acres, having five and six bedrooms and three baths, and selling from $25,000 to $45,000. 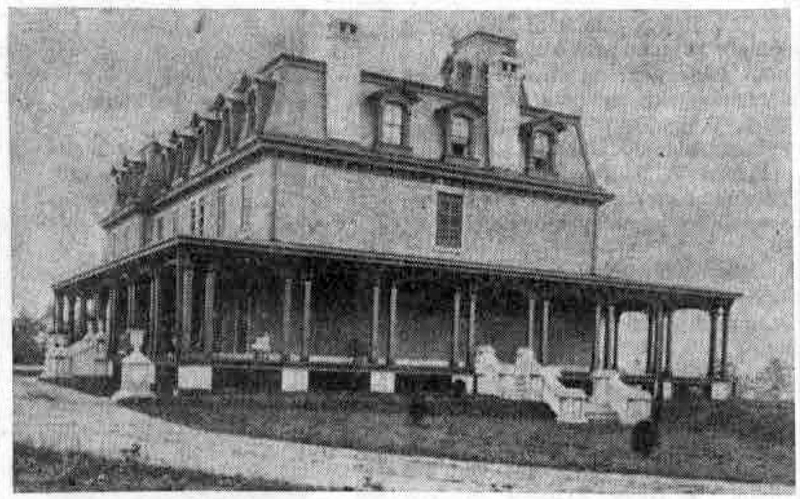 Among the unusual features of these houses were “old cranes in each fireplace (not reproductions); old wood carved mantels – some 100 years old (not reproductions) and individual built-in telephone booths (not coat closets).” At the time this advertisement was published 37 plots had already been sold. Two real estate dealers who operated close to Wayne were A.H. Crockett, of King of Prussia, “the Gateway to Valley Forge,” and G.B.Wheeler, of Devon, who advertised houses “not just built to sell, but built to live in for generations… Anticipating Tomorrow, but realizing Today.” Unfortunately the “Tomorrow” was not the one to be anticipated with pleasure, for that “tomorrow” brought the depression of the early 1930’s. The purpose of the publication was to “foster the better upkeep and beautification of the Main Line, that it may remain as it now is – the most desirable suburban residential section in America.” And to many loyal Main Liners, this rather broad statement seems as true today as it did to the publishers of the booklet 27 years ago. In the midst of all the pictures of handsome homes, churches, office buildings, banks and shops of the Main Line which fill the pages of the booklet, the picture shown at the head of this column is refreshing because of its human interest. 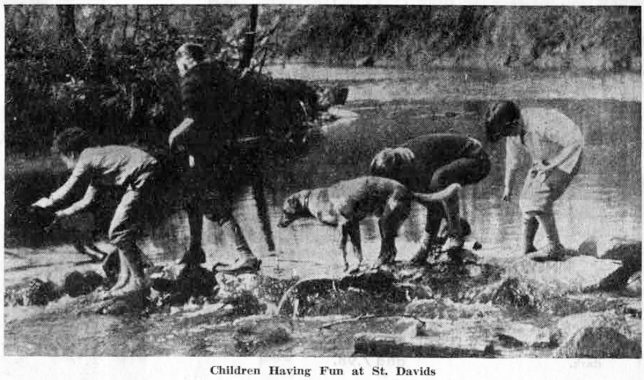 Among the four boys all so intent on lifting stones from the creek, there may be this columnist’s own sons, and certainly must be their playmates. Patterson boys and playmate of all the Midland avenue children. And the clothes these boys are wearing! They bring back nostalgic memories of the days when corduroy or tweed knickers, long stockings and heavy woolen sweaters constituted the “uniform” of the boys of the 1920’s as universally as dungarees and plaid shirts do now. It is quite apparent from the length of hair of three of the boys in the picture that a trip to the barber was as much of an ordeal then as it is to those of their age nowadays. And no mother of boys in the 1920’s can fail to remember the struggle to keep the knickers from “drooping” and the garter from losing all connection with the long stockings with their rolled-over plaid tops. “Kids Having Fun at St. Davids” certainly tells the story of this picture. The writer has tentatively located the brook, with its large stones, as one of the small streams on the former Charles E. Walton estate, now the property of Eastern Baptist College. More positive identification by some one who may recognize the boys in this picture would be interesting.